One of the biggest reasons to go solar is that you can eliminate or significantly reduce your electric bill. An average monthly electric bill of $100 becomes an annual $1,200 expense. Over 20 years, that same $100 monthly bill balloons to $24,000 paid to your utility, and that’s before factoring in electricity rate increases that will likely make your 20-year energy costs even higher. Installing a solar panel system at your home or business takes you out of this cycle. Going solar can eliminate your electric bill completely or reduce it so dramatically that electricity costs are no longer a significant factor in your budget. Your savings with solar depend on a few different factors, like how much energy your system produces and how much you consume, but the biggest factor is the rates you would otherwise pay to your utility. Because your savings are equal to the costs you avoid by going solar, you’ll save even more if electricity rates are high in your area. And, since electricity prices will continue to rise, your savings will continue to grow every year over the 25+ year lifespan of your solar panel system. Reducing one of your largest monthly expenses makes perfect sense, but the benefits of solar aren’t just economic. 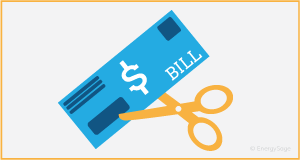 Because electricity prices can be unpredictable, they make managing your budget difficult. By installing a solar panel system, you also fix your electricity costs and make them more predictable. This is especially beneficial for anyone with a fixed income, as well as for businesses who stand to gain from a more stable cash flow. When you make your electricity costs more predictable by going solar, you also improve your expense forecasting and management capabilities.